During the 11th century three buildings were constructed in the ‘Field of Miracles’ including the circular bell tower we now know as the Leaning Tower of Pisa. The first foundation stones of marble and lime were set down in 1173 although the bell tower was not built in one attempt. Three stories were built by 1178 but a lack of money meant building stopped. Unknown to the architect this area had once been a large river delta which had deposited sand, making the area unsuitable for large, heavy buildings. The tower had already started to lean to the south. When building continued in 1272 heavy counter weights were added to the north side to prevent further leaning. By 1360 the tower was still leaning towards the south and consequently more steps were added to the top. Six steps were added to the south side and four to the north side. This was an attempt to prevent the angle of lean becoming worse. The tower was completed in 1370. The tower continued to lean and the results of surveys and tests carried out in the 1990s suggested that it would collapse by the middle of the 21st century. Attempts to prevent further leaning failed and in fact made the situation worse. The English engineer John Burland came up with a unique solution. His idea was to extract sandy soil from underneath one side of the tower and this, he believed, would reduce the angle of lean. His idea included the use of special drills to slowly remove soil whilst steel cables held the tower just in case the extraction failed and it began to collapse. Work began in 1998 and the system slowly worked - the lean was reduced to the same angle as it was in 1838 (this took over two years)..
1. 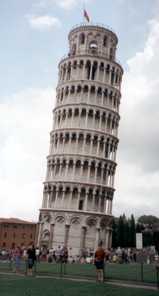 Draw a map of Italy and clearly show the location of the town Pisa. 2. Using a simple diagram, explain how the lean of the tower was reduced.